Versatile documentary-style camera that combines exceptional image quality and affordable CFast 2.0 workflows with an ergonomic design optimized for single operator use and extended shoulder-mounted operation. Hardy enough to take anywhere and features in-camera grading with pre-loaded 3D LUTs, as well as 200 fps slow motion. Featuring the same sensor and exceptional image quality as the ARRI ALEXA, AMIRA records superior HD 1080, 2K or UHD pictures that are suitable for any distribution format. With a dynamic range of more than 14 stops, low noise levels, subtle highlight handling, natural color rendering, breathtaking skin tones and speeds of up to 200 fps. Throughout its long history ARRI has offered film and program makers a range of diverse cameras suited to different production tasks. Whether it was the handheld ARRIFLEX 35 simplifying location shooting in the 1930's, the compact 16 ST revolutionizing television in the 1950's, or the self-blimped 35 BL and 16 SR changing the visual landscape of the 1970's, ARRI’s camera line-up has always comprised varied models for multiple uses and budgets. Common to them all, however, has been the promise of creative liberation through functional, user-friendly design. AMIRA represents a seamless continuation of this tradition. It will sit alongside other camera offerings from ARRI and fill its own particular niche, perfectly answering the needs of certain types of camera professional and certain types of production. 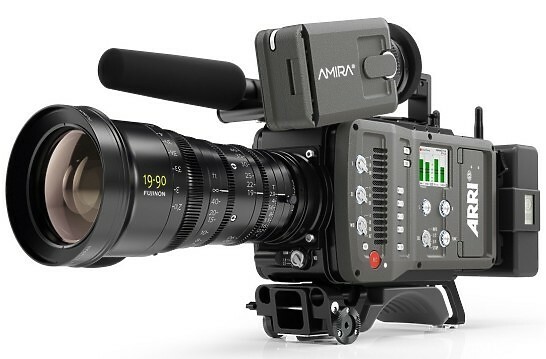 AMIRA features the same sensor and exceptional image quality as the ARRI ALEXA, recording superior HD 1080 or 2K pictures that are suitable for any distribution format. With a dynamic range of more than 14 stops, low noise levels, subtle highlight handling, natural colour rendering, breathtaking skin tones and speeds of up to 200 fps, AMIRA will deliver beautiful, life-like images in any situation. AMIRA records Rec 709 or Log C images using ProRes LT, 422, 422HQ or 444 codecs. By recording to in-camera CFast 2.0 flash memory cards with super-quick data rates, the route into post'production is made as simple as possible. CFast 2.0 is an open format, easily accessible to anyone and delivering a fantastic price-performance ratio through incredible transfer speeds, long recording times and compatibility with standard IT tools. Costs per GB are brought right down and higher-than-broadcast-quality image pipelines are made available even to low budget productions. AMIRA boots up quickly and can be used straight out of the bag by a single user, with no setting up, no rigging and no delays. In the time it takes to lift the camera to an operator’s shoulder, it will be ready to record, making AMIRA perfect for ‘run-and-gun’ shoots where the action is unpredictable and the camerawork responsive. Integrated, motorized ND filters as well as zebra and false colour tools aid exposure control, while an advanced peaking function makes accurate focusing easy and swift. Access to switches and configurable user buttons is quick and intuitive. An innovative multi-viewfinder makes life even easier for the single user by combining a high resolution OLED eyepiece with a fold-away LCD monitor that displays a live image when the eyepiece is not in use and also provides full access to camera functions, without AMIRA having to be removed from the operator’s shoulder. Flexible multi-channel audio options are accessed from the camera right side, again minimizing disturbance to the operator. In today’s environment of cut budgets and shortened schedules, many television productions do not have the luxury of spending time finessing a look in post-production. AMIRA is unique in that it comes with a number of pre-loaded 3D LUT-based looks that can be applied on set during the shoot. Alternatively, productions can custom-build their own 3D LUTs in external grading systems, load them into the camera during prep, and even modify them in-camera while filming. With 3D LUTs, literally any look that can be imagined can be created, giving cinematographers and directors a greater degree of creative control on fast-moving productions, while keeping post-production costs down for producers. Like all ARRI products, AMIRA is designed to be a safe, long–term investment and built to withstand the rigors of life on a professional set. With a solid internal skeleton that guarantees camera and lens stability, AMIRA is a highly durable product constructed of the strongest possible materials. Sealed electronics provide top-level protection against humidity and dust, while an integrated thermal core results in highly efficient cooling. Productions can take AMIRA anywhere, from jungles and deserts to snow-capped mountain tops, sure in the knowledge that it will not let them down. Hire the ARRI AMIRA from Procam. Best service and rental rates for the ARRI AMIRA and all cameras, lenses, sound, lighting and grip.